Today, varsity boys’ soccer coach Tony Bednarksy was named Skyland Conference coach of the year. 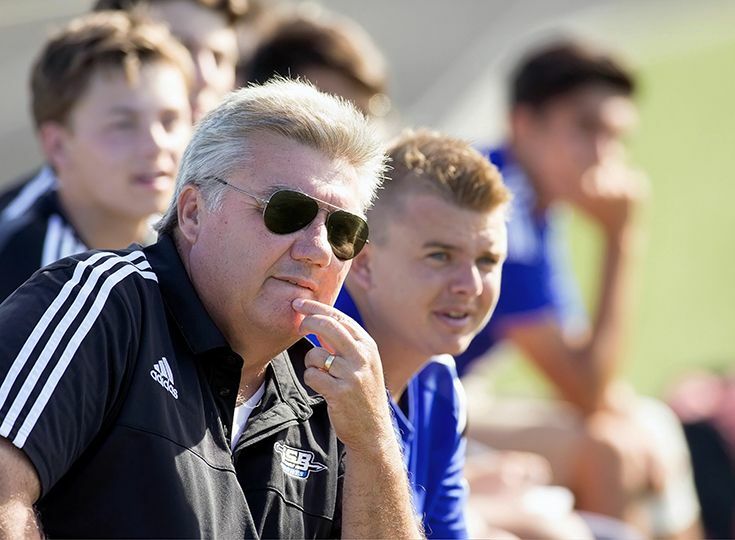 This fall, Bednarsky completed his 29th season as head of the boys’ soccer program at Gill. During his tenure at the school, he has accumulated 428 wins, five sectional championships, eight Prep B titles, 17 Skyland Conference championships, three state championships… and counting. He was named State Coach of the Year in 2009. After last November’s state championship, Bednarsky bid farewell to nine seniors, all of whom had been major contributors to the championship season. This fall, he was tasked with rebuilding the squad with a roster comprised largely of underclassmen. After two losses early in September, the boys started posting wins. Goals came from throughout the ranks, players at every level delivered in big moments, and well-coordinated defensive play helped the team edge out a series of opponents. Winning close-fought matchups, the Knights made it to the semifinal round of the Somerset County tournament, the finals of the Prep B championship and the sectional semifinals of the state tournament. The squad ended its season 13-8-1 overall and 9-1-1 in the conference division. Next fall, a more-seasoned group of players will join Bednarsky for his 30th season with Gill St. Bernard’s. In addition, the fall is likely to bring another milestone for the coach who holds 497 career wins.